Beyond airplanes and atom bombs, few things symbolize 20th century America more than comic book superheroes. Just as ancient Rome believed in all-powerful deities like Apollo and Minerva, kids in midcentury America --often called a "new Roman empire"--believed in Superman and Wonder Woman. Their appeal knew no borders, and the vintage examples found by artist Christopher Saucedo on his travels were often boundlessly surreal, so he began to subtly modify them to enhance their idiosyncratic qualities and make them his own. 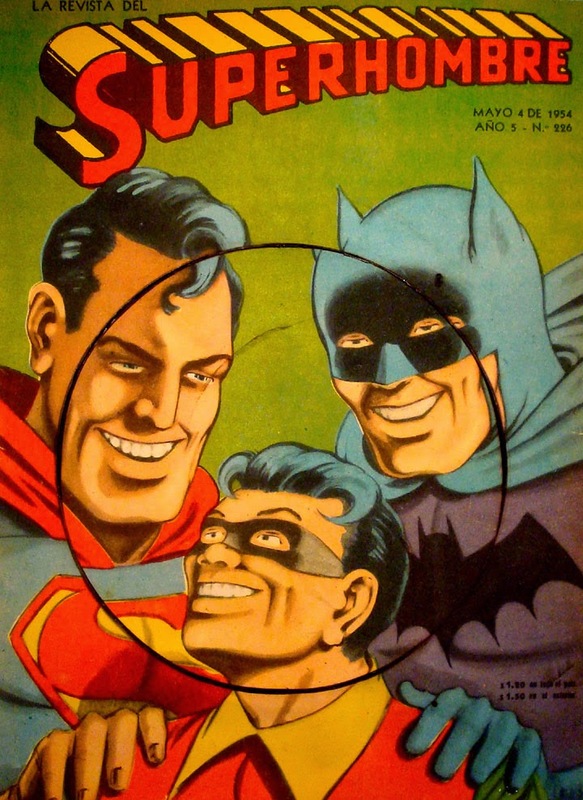 Their multicultural appeal is seen in a poster-size blowup of a 1954 "Superhombre" comic book cover, upper left, with Superman, Batman and Robin grinning luridly. Here their Mexican wrestler - style facial features indicate that early globalism produced its share of forgeries, but even the official editions yielded some pretty bizarre cultural hybrids. 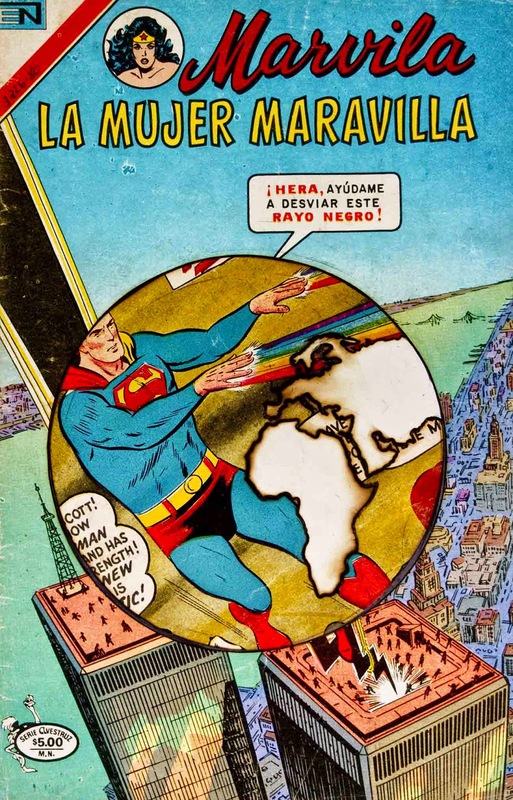 Saucedo's modifications often employ minimal and strategic touches like his sometimes embroidered compass symbols of the sort used to indicate north on maps, emphasizing how disorienting these globalized superheroes can be. In a 1978 Hispanic version of Wonderwoman, La Mujer Maravilla, left, the Twin Towers loom over a New York City apocalypse scene long before 911, and while this entire series is entertainingly surreal, it obviously doesn't hurt to start with such super-bizarre source materials. In Ayo Scott’s Octavia Gallery solo, mythic beings and modern technology populate a dramatic array of collages and digital drawings. 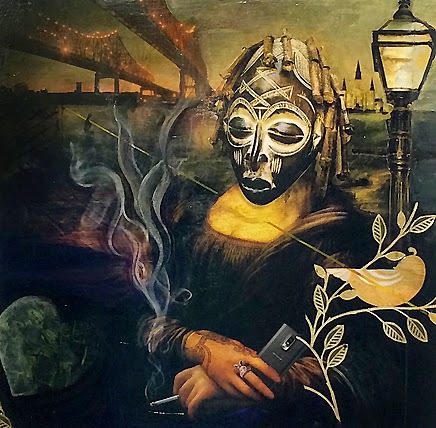 His most cogent collages include Study of a West Bank Smile, a Mona Lisa with an African spirit-mask for a head posed pensively by the river amid wisps of cigarette smoke. 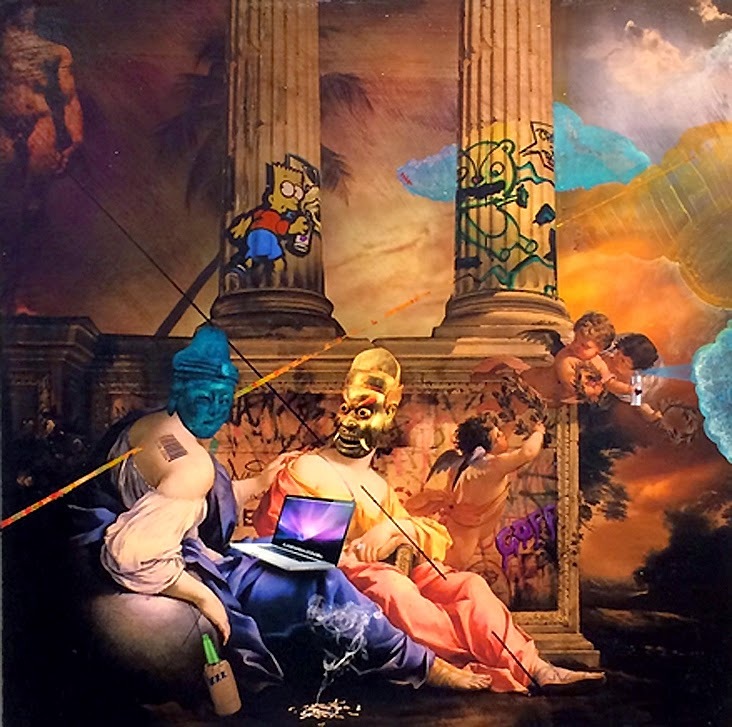 In Study of the Miseducation of Cupid, above, two renaissance odalisques with east Asian devil masks indulge in cigarettes and booze while doing something devious on a laptop amid the ruins of a classical Greek temple in a example of how he samples times and styles to reframe the present moment in a more insightful context. His more rollicking digital drawings feature related carnivalesque mash-ups like pixelated riffs on Robert Collescott, but the whole show represents an eloquently cohesive evolution of Scott's rather complex vision, another step in his self-described ruminations on this city's "syncretic tensions" as well as "consumerism and technology's interaction with the transcendent." ~Bookhardt ﻿Comic Book Diplomacy: New Work by Christopher Saucedo, Through Sept. 7, Good Children Gallery, 4037 St. Claude Ave., 616-7427; The Lies We Believe: New Work by Ayo Scott, Through Sept. 6, Octavia Art Gallery, 454 Julia Street St., 309-4249.